Know your candidates before you head to the early voting polls this upcoming week. Those who live in Franklin, Fairview and the unincorporated parts of Williamson County have plenty of options on their ballots for those running for the Williamson County School Board. 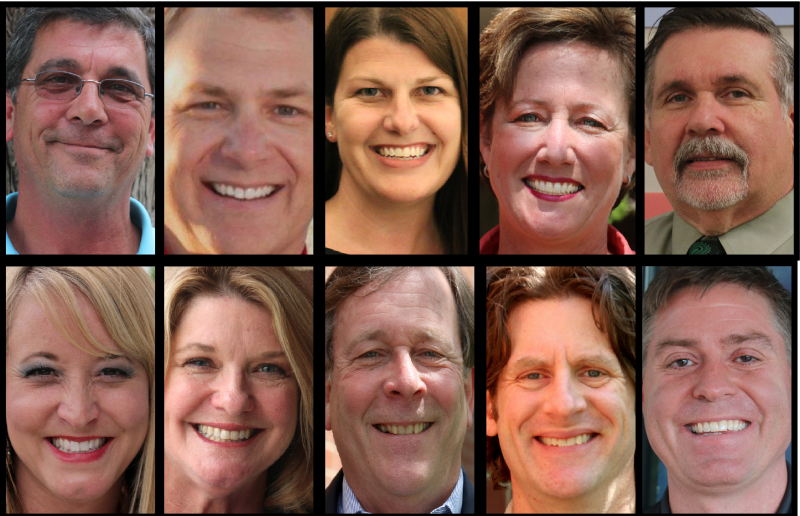 Here are your school board choices broken down by district. Davis said his family has been in Williamson County since 1790, though Davis didn’t start living in what he joked as the suburbs of Kingfield until he was 5. His dad’s career in the Navy shuffled them around before then. He currently has two children in school – a son at Independence High School and a daughter at Hillsboro. This second quarter, he raised $1,450 and only spent $200. His biggest contributors were Cynthia Miller, of Brentwood, and the candidate himself. He has no outstanding loans. Fairview mom Angela Durham said she wants to become an ear for parent opinions and an instrument to help the school system grow in a positive way if she is elected to the District One seat of the Williamson County School Board. Growing up in Memphis, Durham moved to Nashville to attend Lipscomb University. She has her bachelor’s degree in management and her master’s degree in business administration. She currently works for AMSURG as vice president of anesthesia service, and has worked there for the last six years. She and her husband moved their two kids from Bellevue to Williamson County for the school system. She said she’s enjoyed living in Fairview because of the mix of people and the cluster of schools that still consist of a clean feeder pattern. She has previously worked in both the elementary and middle school PTOs while her fourth- and six-graders attend school. She said serving on the PTO gave her a sense of the inner workings of the schools in Fairview. This quarter she raised $1,200 in campaign dollars. Approximately $500 came from the WillCo Rising PAC after its endorsement of her and another $700 came from her. This quarter he raised $2,439. His biggest contribution came from Cynthia Miller, of Brentwood. He has $1,618 left on hand. She has raised $4,950 during the second quarter. Her biggest contributions came from Doug Young, of Franklin, and the WillCo Rising PAC that endorsed her earlier this summer. She is left with $4,442 on hand and started out the quarter with $2,032. Nolensville’s Gary Anderson said he will run based on his experience when it comes to keeping his board seat in the Fifth District. He raised $3,404 and spent $2,135. He has $2,269 left on hand with one loan outstanding totaling $1,969. His biggest contributors came from the Williamson Business PAC and the WillCo Rising PAC. After adopting her youngest three children, she discovered two of them have lifelong learning disabilities, so Mauck made the decision to be a stay-at-home mother for several years. Mauck raised $3,600 and spent $2,880. Her biggest contributions came from Tracy Miller, of Brentwood; Jeff Besler, of Nashville; and Noralee Nelson, of Franklin. Boothby’s children had different experiences going through the system. Her oldest son had dyslexia and trouble with audibly processing at the same speed as his classmates. Needing a different way to learn, he went through an individualized education program. Boothby said she wants to bring the perspective of her two different experiences — her youngest son could adapt to the school tempo and way of learning of his classmates — to the board and potentially shed insight on how the system could better address the needs of all children. She raised $5,400 and spent $2,135. She will end the quarter with $3,464. Her biggest contributors were Tracy Miller, of Brentwood; Jeanne Locante, of Franklin; and Stuart Anderson, of Franklin. After four years of serving on the Williamson school board, Rick Wimberly is hoping to keep his District Nine seat for another term. District Nine covers a vast amount of territory from Hillsboro Elementary to Winstead Elementary School. Wimberly has been surrounded by educators in his family, from his dad’s superintendent seat to his wife teaching in the Williamson school system. Four of his children went through the local schools, with two of them now in education occupations. The Grassland dad moved to Williamson County after a job transfer. After working in TV and radio for two decades, he transitioned to the president of Galain Solutions, Inc. which provides consulting services for emergency alerts. He’s also on the Board of Trustees of the Education Foundation for Williamson County and was the founding chair. He also volunteers with the Boy Scout Troop 444 and served on the Parish Council for St. Philip Church. In his spare time, he also helps with Destination Imagination, which promotes creative problem solving through an array of competitions. Wimberly raised $5,620 this quarter and only spent $1,548. He is left with $4,361. His biggest contributor were the WillCo Rising PAC and the Williamson Business PAC. He raised $5,002 and spent $1,371. He will end the quarter with $6,423 and had a balance of $2,792 from his first quarter report. His biggest contributors were mostly in unitemized contributions and the WillCo Rising PAC. He raised $3,779 this quarter and spent $2,611. He will end the quarter with $1,962 and started with $795. His campaign disclosure is missing one $500 with his campaign team sending an addition to the Williamson County Election Commission. His biggest contributors were Larry Cooper, of Spring Hill and Tracy Miller, of Brentwood.